You will need the remote MAC address of the DWL-2200AP you are bridging to. Step 1: Connect the DWL-2200AP to your PC using an Ethernet cable. Step 2: Your computer will need to be in the same IP address range as the DWL-2100AP for configuration. The default IP address is 192.168.0.50. 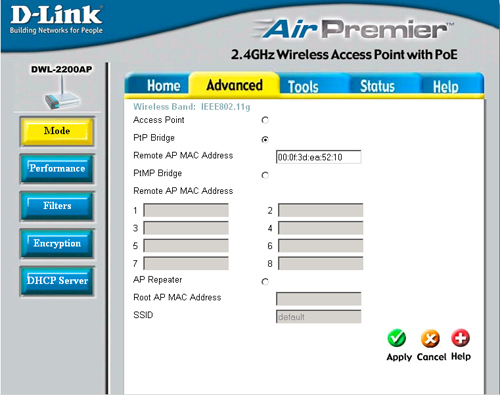 Step 3: Open a web browser and enter in the IP address of the access point (http://192.168.0.50). The username is admin (all lower case) and the password is blank (nothing). Step 4: Click on the Advanced tab and then click on Mode on the left side. At the top, click the PtP Bridge radio button. Enter the remote MAC address of the device you want to bridge to (IE 50:23:AB:D4:56:E1). Then click onApply to save your changes. Step 5: Repeat the instructions for the remote access point. Click Apply to save your settings. Note: If you have encryption enabled, ensure the key matches on both access points. Also, ensure that both access points do not have the same IP address. By default, the IP address is 192.168.0.50.